Sunseeker France and Sunseeker Monaco have confirmed dates for the first of two Open Weekends to be held in the region this year, both with a twist. The first event, to be held in the Port of Beaulieu-sur-Mer on 3rd to 5th May, will feature new models from the Sunseeker range and details of the new Sunseeker 155 yacht project, plus a unique 'pop-up' test centre by Porsche. Clients will be able to test drive either a luxury car or a luxury motoryacht, or both. 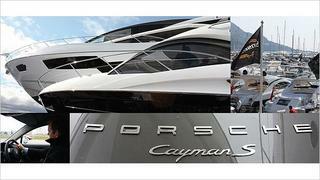 There will be experts on hand from Sunseeker and Porsche to discuss all aspects of ownership.